SAN DIEGO – In the 14th annual Perfect Game All-American Classic, held again this year at Petco Park in beautiful San Diego, the West team jumped on the East squad early and often en route to a convincing 13-0 win. San Diego native Nick Allen, who was named the Perfect Game defensive player of the year during the festivities in his hometown, stole the show with his glove in the top of the first inning. With a runner on first, Allen dove deep in the hole at shortstop and showed off his great arm to get the Canadian Adam Hall (London, Ontario) at first base by half a step. It was the first highlight that Allen gave his hometown crowd, but it certainly wasn’t his last. No. 1 overall prospect Hunter Greene (Stevenson Ranch, Calif.) got the start for the West squad on the mound, showing off his arm while touching 97 with his fastball. The 97 mile per hour fastball was tops in the game, and Greene also had the fastest exit velocity at the plate, hitting a ball up the middle at 105 miles per hour. There is much debate on whether Greene will be a pitcher or a shortstop at the next level, and he certainly showed the ability to do either extremely well tonight. In the bottom of the first inning, D.L. Hall (Warner Robins, Ga.) made it seem like we were in for a pitching duel, working a clean inning for the East team. It took only one more inning for that thought to leave everyone’s mind, as the West squad burst the game wide open with a five-run second inning. Calvin Mitchell (San Diego, Calif.) roped a line drive into right field to start the inning, followed by a Cole Turney (Richmond, Texas) base hit to left field. Garrett Mitchell (Orange, Calif.) followed that with a long at-bat that ended with a walk to load the bases, and then M.J. Melendez (Montgomery, Ala.) started the scoring with an RBI single through the right side. Jacob Gonzalez (Scottsdale, Ariz.) had the biggest hit of the inning, a two-run single down the left field line to move the score to 3-0, and RBIs by Jayson Gonzalez (Covina, Calif.) and Allen pushed it to 5-0 before the inning was over. Every coach looks for their pitcher to have a shutdown inning after they hang a crooked number on the board, and that is exactly what Kyle Hurt (Rancho Santa Fe, Calif.) gave the West squad in the top of the third. Hurt worked at 93-94 with his fastball and was helped out by Garrett Mitchell in right field when Mitchell recorded his second outfield assist in the first three innings. Blayne Enlow (Sorrento, La.) showed what some say is the best curveball in the class in the bottom of the third, but a sac fly by Garrett Mitchell to score Greene made the score 6-0 in a hurry. Hans Crouse (Dana Point, Calif.) made the top of the fourth pretty uneventful for the East squad, stifling them with a 96 mile per hour fastball and a curveball that had multiple hitters ducking out of the way. Quentin Holmes (East Elmhurst, N.Y.) did put a good swing on a Crouse fastball for a sharp single back up the middle, but he wasn’t moved from first base. It looked like Hunter Ruth (Gainesville, Fla.) was going to get through the bottom of the fourth unscathed, even though he was working with the bases loaded. After a walk to Allen to fill the bases, Ruth got a groundball up the middle that should have been a double play, but a bad throw sailed into the seats and allowed two more West runs to score, making it 8-0. Alex Scherff (Colleyville, Texas) had another one of those shutdown innings for the West squad in the top of the fifth, using a 95 mile per hour fastball and a Bugs Bunny changeup to throw a scoreless inning. Jordon Adell (Louisville, Ky.) made solid contact back up the middle against Scherff, and Cole Brannen (Elko, Ga.) knocked a base hit right after him, but the most impressive play of the inning came when Melendez threw out Adell, one of the fastest players in the country, trying to steal third. Even with the score at 8-0 in the bottom of the fifth, Phillip Clarke (Franklin, Tenn.) hit the first extra-base knock of the game for the West team with an RBI double to the right-center gap. A passed ball in the inning ran the score to 10-0 in favor of the West. Caleb Sloan (Centennial, Colo.) had a fairly easy inning of the mound for the West in the top of the sixth, as most of the West pitchers did all night. He was getting a lot of check swings and hitters looked confused against him. Tim Elko (Lutz, Fla.) hit a hanging breaking ball back up the middle for a single, but that was the only blip on Sloan’s night. 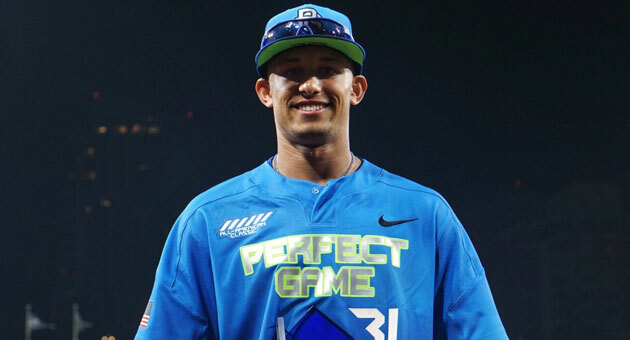 Allen added yet another base hit in the bottom of the sixth to get the West’s wheels turning yet again, and game MVP Royce Lewis (Aliso Viejo, Calif.) scored him with an RBI triple over the center fielder’s head into the deepest part of the ballpark. Lewis, who is one of the fastest players in the 2017 class, looked like he might be sent home to try for an inside-the-park home run, but he was held at third. A couple of errors at shortstop moved the score to 13-0 in the bottom of the sixth. Shane Baz (Cypress, Texs), Nicholas Storz (Brooklyn, N.Y.), Seth Corry (Highland, Utah), Joe Boyle (O’Fallon, Mo. ), and Logan Allen (Deltona, Fla.) combined to throw the seventh and eighth innings, and all five pitchers had very limited damage done against them. Baz showed a really good slider, Corry showed he is all the way back from a knee injury and Boyle was touching 95, which he hasn’t shown before. Mitchell Stone (Oklahoma City, Okla.) and Jeremiah Estrada (La Quinta, Calif.) combined to throw the top of the ninth, throwing a 1-2-3 frame to seal the win for the West. 2016 Perfect Game Jackie Robinson Award winner Greene loosened up for his start on the mound for the West Team by winning the Classic’s Home Run Challenge, which concluded about a half-hour before the game’s first pitch. Greene, a UCLA commit, hit towering home runs into Petco’s second level seats in left field with each of his first five swings to top hometown favorite Calvin Mitchell from San Diego, 5-4, in the Challenge’s final round. Six bombardiers took part in the semifinal round of the Classic’s Home Run Challenge at Petco immediately before the finals. Each of the six were allotted two minutes and 30 seconds to hit as many home runs as they could, and were awarded an additional 30 seconds when they delivered back-to-back jacks. Greene, a right-handed hitter, was the main-man in the semis, as well, smashing 11 home runs to lead the pack; Mitchell, a left-handed hitter, joined him in the finals on the strength of six bombs. The West’s Turney delivered three homers in the semis and his West teammate Jayson Gonzalez smacked a pair. Both of the East Team semifinalists – Adell and Storz – bowed out with two home runs apiece, matching Gonzalez’s output. The six sluggers advanced to Sunday’s final round by combining to drop 67 bombs during Saturday’s first round held at the University of San Diego’s Fowler Park, a much more home run-friendly ballpark than Petco Park. Storz launched 13 rockets out of Fowler, while Adell and Gonzalez each sent 12 into orbit. Greene, Turney and Mitchell each parked 10 bombs on the other side of the outfield walls at Fowler’s friendly confines.